Whenever you need to be able to hoist or lift a weighty object from the floor onto a higher level, having a lifting system that you can rely on is essential. 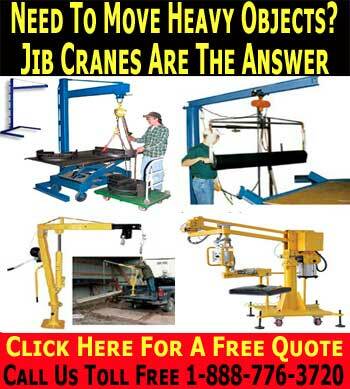 Unfortunately, there are always situations where it is simply not possible to use conventional lifting gear such as jibs or fork lifts, and under these situations, when it is necessary to be able to raise a weight quickly, then a cantilever hoist is often the best choice. These small portable cranes are ideal for lifting heavy weights up to 4,000 lb depending on the model, and are designed to be used in circumstances when other alternatives are unavailable. The high specification of the cantilever hoists offered by Easy Rack makes them a formidable option for any workplace, and they provide a fully reliable and useful addition to any arsenal of equipment. 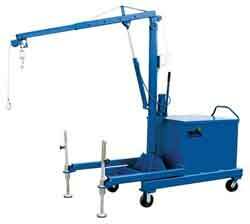 The standard cantilever hoist offered by Easy Rack is a well made and sturdy device that can be moved easily into place wherever it is required, and then can raise heavy weights effortlessly thanks to its heavy duty hand pumped hydraulic pump lifting system that can lift 2,000lb onto a truck in seconds. 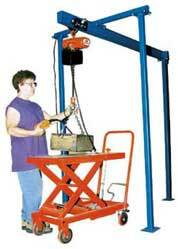 The principal concern whenever lifting heavy objects on an uneven surface is to ensure stability. The basic design premise of a cantilever hoist is to include a heavy counter weight that opposes the load and ensures longitudinal stability in use. This use of a counterweight is backed up by a relatively wide chassis on fully lockable 8” by 2” phenolic casters. IN order to offer additional support under circumstances where it is required, the cantilever hoist also offers a set of easy to set out riggers that ensure lateral stability under almost any conditions. The boom on the hoist is hard wearing and designed to last. It sits on a 360 degree rotating joint to allow for a weight to be hoisted off the ground and then swung effortlessly into the back of a truck or onto a raised working surface. The main use for this lifting tool is undoubtedly in hoisting weights onto the back of a truck, but thanks to the ease with which it can be deployed almost anywhere in a matter of minutes, it is a useful back up for many situations, and can even be utilized for hoisting an engine block from a vehicle if necessary, as well as any other heavy lifting job that you need a tool you can rely on for. As you continue to read through our selection of Cantilever Hoists, keep in mind we stand ready to answer any questions you may have about our offerings. Call us at 1-888-776-3720 whenever such questions arise and let us help you make the best investment within your budget. We are located in Houston, Texas.